The "Hexx" target is our new pistol challenge target. 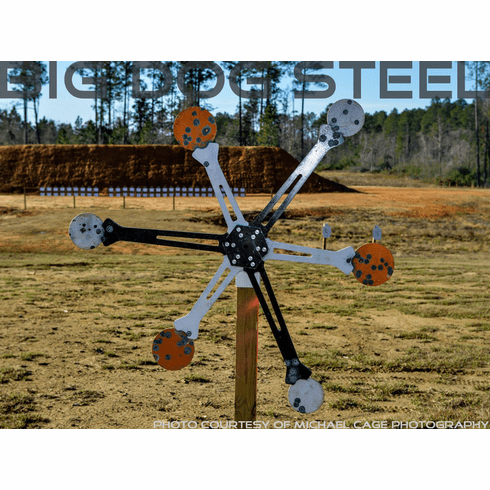 Featured at this Year's 2014 Big Dog Steel Challenge that was held at K & M Shooting Center in Baker, FL and hosted by Big Dog Steel. The target features (6) targets that will detach from the arm when shot. When a target is hit, the entire target frame rotates due to the imbalance of the missing target and creates a challenging scenario for the shooter. The frame features (6) arms of two varying lengths and two different target sizes that allow the shooter, or match director, to create unique scenarios based on the skill level of the shooter. The target frame rotates with a pair of high quality ABEC rated, nickel plated bearings. Each Hexx target assembly comes with everything you need right out of the box, all the nuts bolts, springs, etc. We even include the portable "H" base. All you need is a few minutes to assemble the frame and base. We pre-assemble the arms for faster set up times. Target is rated for most popular action pistol calibers. Due to the complexity of the target assembly please allow 7-10 to build each target. Please contact us prior to ordering if you are on a tight timeline.